I have planted about 29 rose bushes in our home garde, about a month ago. They all have survived and started some shoots and buds. 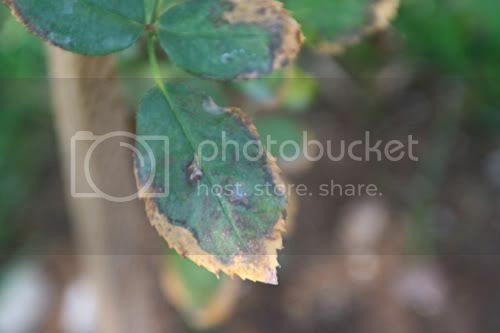 Many of them have had rusty leaves, which I can search the net and find a solution (hopefully); however one of those rose bushes have developed some sort of disease which I need your help. Here are two photos I have taken before cutting off all the leaves including new shoots. is there anything else I should do? How could I make sure it does not spread (my roses are close to each other but not touching). Hello, albahhar. The black color on the first photo suggests a fungal infection such as blackspot. See http://www.ars.org/pdfs/blackspot.pdf for more information. The brown color on the edges of the leaves could suggest a soil moisture problem (the leaf edges turn brown when they do not get enough water). 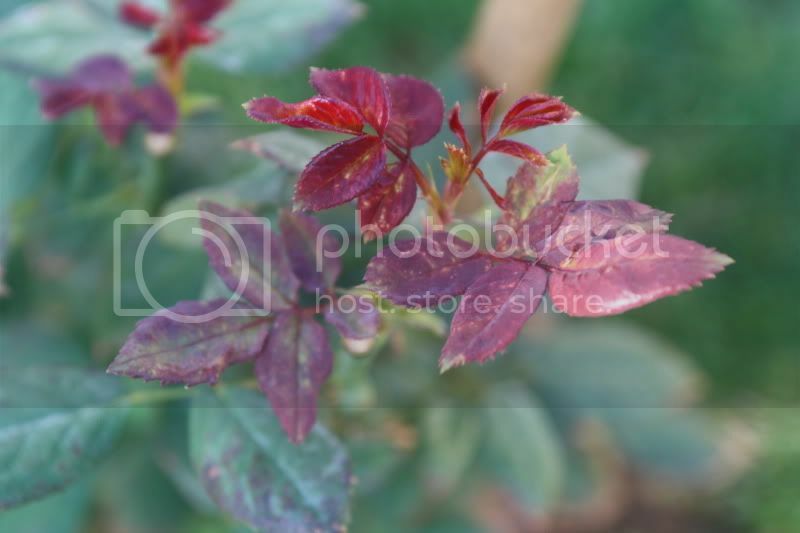 The red color on new shoots is a pigment that some rose varieties display when they leaf out and produce new shoots. Eventually, these leaves turn green. It is not a problem, only something that certain roses do. I noticed some yellowing on those red leaves. In my case, the problem goes away on its own or turns out to be caused by soil alkalinity where I live. Most of the time, I wait for the leaves to change color to green; if the yellowing has not gone away on its own, I then check the soil pH and, if necessary, I apply a soil acidifying liquid or powder compound according to the label directions. So in your case, wait until your roses' leaves turn green before taking action and then monitor things. Do not let the roses get too "close" to each other. You need to maintain good airflow between shrubs to minimize fungal infections. How did you place photos in your post? Welcome to the forum, ledbelly!